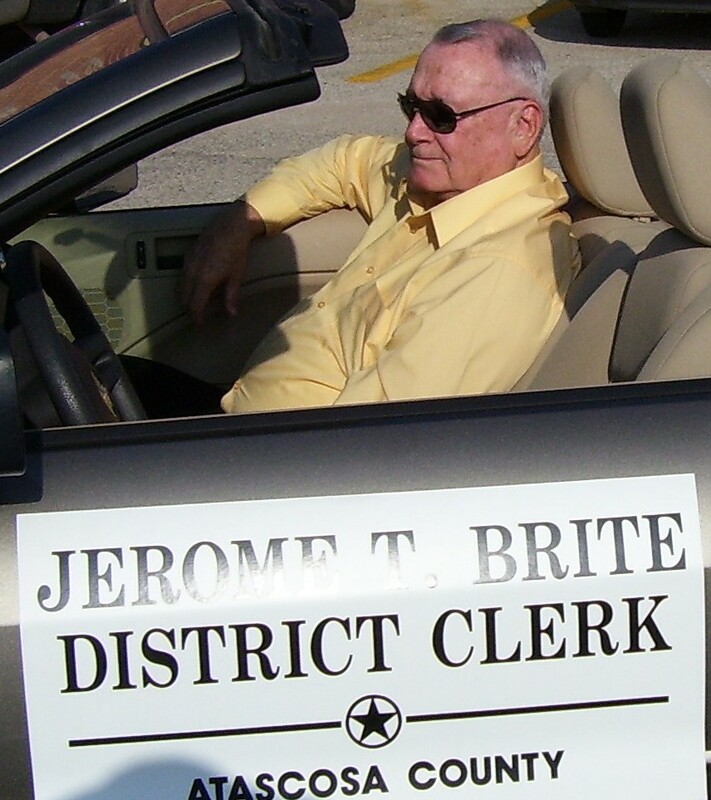 Jerome Templeton Brite, of Pleasanton, passed away on Monday, July 27 at the age of 82. Jerome was raised in Pleasanton, and graduated from Pleasanton High School in 1950. He attended the University of Texas, where he pledged the Sigma Chi Fraternity. He then joined the Army, proudly serving our country. After that, Jerome returned to his studies, graduating from Texas Tech University in 1959. He owned Brite Tax Service and Brite Office Supply, and worked as a tax accountant. In 1992, he became the District Clerk of Atascosa County, and served in that office until his retirement in 2010. Jerome is survived by his wife Margaret Stefanagge Coleman, sons Lee Brite and wife Holly of Kerrville, Charles Brite of Blanco, step-daughter Stefanie Sims and husband Tad of Von Ormy, grandchildren Austin Brite, Pierce Brite, Ben Snelgrove and Sam Snelgrove, and nephews Cole Lamb and Yancy Lamb. Jerome is also survived by numerous cousins, great nieces and nephews, and a host of friends. He was preceded in death by his parents, Jerome Duck Brite and Letha Brite, sister Florice Brite Ogden, niece Sandra Stendebach, and nephew Jerry Ogden. Funeral services will be on Saturday, August 1 at 2:00 pm at the Hurley Funeral Home in Pleasanton. The family would like to thank his caregiver, Jennifer Henderson for all of her help and assistance. They ask that in lieu of flowers, donations be made to the American Cancer Society, or the Our Lady of Grace Academy in Pleasanton.